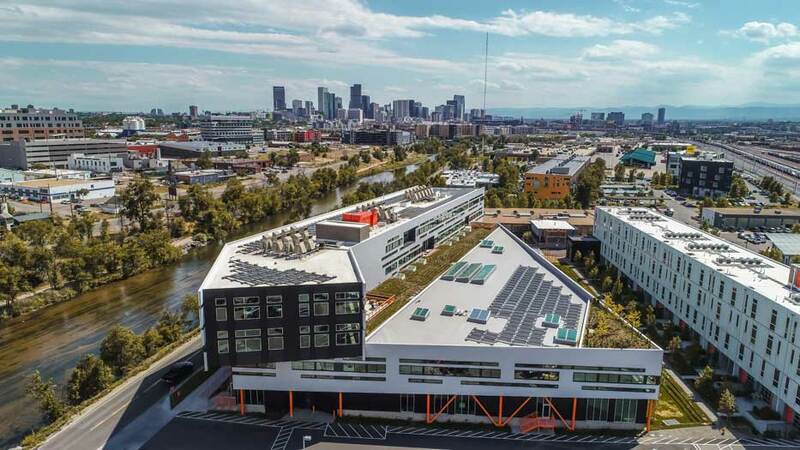 Recently, Douglass Colony Group installed EcoFoot2+ 10-Degree Racking on this new office building in the heart of Denver's RiNo District. The Flight Building is designed to provide sustainable workspaces in the 140,000 sq. ft. structure. The design includes one of the city's largest private green roofs. For more project photos, click here. Douglass Colony is the largest commercial roofing, metals, solar, and waterproofing company in Colorado and the Rocky Mountain region. EcoFoot2+ is a 10-Degree solution for low-slope roofs. EcoFoot2+ has an impressive install speed of 13.5 modules per installer-hour, as rated by DNV-GL. The roof-friendly ballasted system is industry-preferred for its simplicity of installing and transporting and speedy installation. Ecolibrium Solar is the leader in solar racking solutions for commercial and residential rooftops with more than 800MW installed on flat and pitched roofs nationwide. The company designs and manufactures simple, cost-effective, and installer-friendly products that maximize solar installation efficiency and minimize costs. Our world-class, innovative mounting solutions are delivered with unparalleled service and support by dedicated, expert staff.